B2B lead generation via email marketing is every marketer’s dream solution. It provides a level of automation that takes on a lot of the workload. The issue is that not every marketer knows just how to use email to its fullest potential in lead generation. As with all marketing efforts and technologies, if email isn’t done the right way, it won’t get the right results. System/Platform—During the past 10 years, marketing automation has become the standard way to deliver emails systematically. This is a critical component of any B2B email marketing campaign to drive lead generation, and therefore the system or platform you choose is equally critical. The right tool will allow you to execute campaigns efficiently and will attract contacts to your company. Tracking and Reporting—In order to clarify the results of your email campaigns, it’s crucial to implement good tracking practices. This is often in conjunction with your marketing automation tracking code and SEO efforts, but it also works closely with keywords and social media efforts. Proper tracking and reporting (and reading of the data) provides the insight that guides necessary adjustments to your campaigns and creates continuous improvements. That turns an email campaign into a much more effective ROI generator. List and target audience—The impact of your B2B email marketing campaign on lead generation hinges upon this single element. Relying on old, outdated information is a sure way for a campaign to fall flat. Make sure that you have the bandwidth and resources to dedicate toward list development and refinement. Sustaining and building the audience is important, so don’t give up once a campaign is launched. List maintenance is just as important for follow-up efforts, so this is not the place to be automated. Content—This is the easiest item to overlook. Upfront content development is difficult for many companies, as is translating content into customer-centric emails. Existing content may not be strong enough to connect with your audience—and content may need to be revised to address each individual segment. Each campaign needs to have content that is relevant, valuable to the customer, and engaging. If you’re in doubt about your content, it’s a wise choice to bring in an outside expert that can help you assess what you have and create a stronger base of communication. Workflow Process—Put designing and improving your workflow into the strategy from the beginning. Any aspect of marketing should be workflow- and process-focused. Build your lead generation campaign to have the appropriate workflow and alignment with sales. Make sure to test the workflow and process for lead handoff or lead nurturing. Nothing is worse than getting leads and having them fall flat once you hand them off to sales. These five keys are just the tip of the lead generation iceberg. Following them will provide you with a great start to get your B2B email campaigns for lead generation up and running. 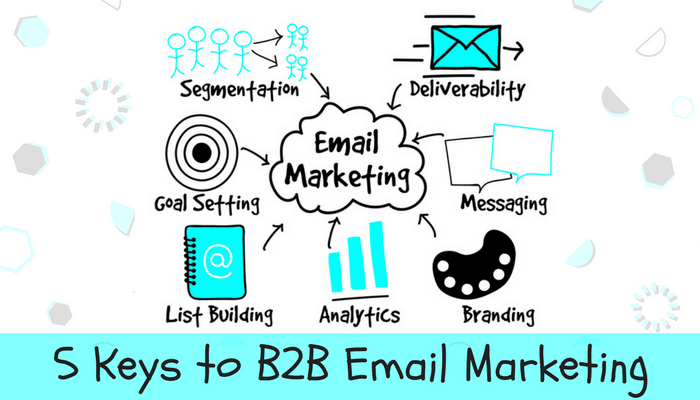 Need assistance engaging your B2B audience via email marketing? Schedule a quick discovery call with one of our email marketing specialists. We have the resources, experience, and technology to help.